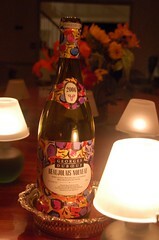 The third Thursday of November has come and that means the release of the 2006 Beaujolais Nouveau. I stopped by the local wine store and picked up a bottle of George Dubouef Beaujolais Nouveau – the first wine of this year’s harvest to be released.Last time this year, I happened to be in Paris upon the release of the 2005 Beajolais Nouveau. Despite having known about the to-do surrounding this wine’s annual release, this year was my first time trying the wine. Notes: Upon opening, it was very yeasty on the nose – smelled like fresh baked breaad. After a few minutes, it turned very tart fruity – not quite citrus, but had mandarin orange smell. On the palate, it tasted just like canned pineapples – with a very sharp metallic (an off-putting tin) end and linger. I didn’t care for this wine on its own – a little too raw for me. However, I did enjoy the wine with some Shropshire blue cheese. I’ve heard that Beaujolais Nouveau pairs very well with sweeter blue cheese. While it did go nicely, the Shropshire was a bit sharp and not as creamy as I would have liked. Whole Foods has a special exclusively made artisinal blue cheese, Persillé du Beaujolais, by a French affineur in the Rhone region of France, which is supposed to pair very well with the wine. I didn’t have time to swing by Whole Foods today, but I will try to get some later this week. Click here to read more about Beaujolais Nouveau and it’s anticipated annual release. ~ by ulterior epicure on November 18, 2006.